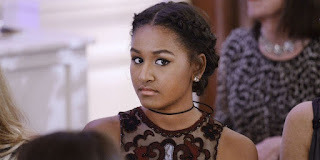 It's just like yesterday, young Sasha Obama was accompanying her dad - on stage, along with her mom and sister as he claimed a historic presidential election victory back in 2008. Sasha isn't a little girl anymore, she's now able to legally drive as she turns 16 years old today. Twitter, B.Scott, Kare Thompson, Rachel Filz, Kat Lee, Caliche, Urban Movies Channel and many others sent her well wishes messages.